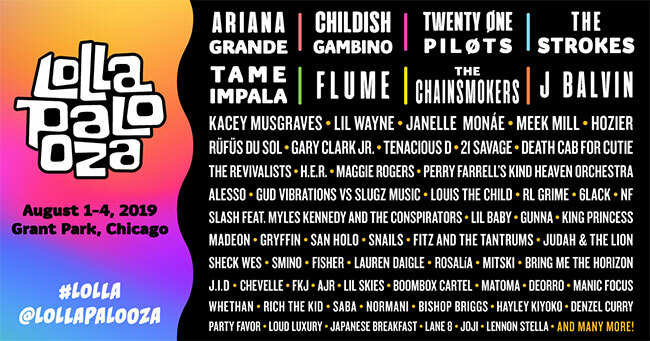 Ariana Grande, Childish Gambino, TWENTY ØNE PILØTS, The Strokes, Tame Impala, Flume, The Chainsmokers and J Balvin will headline this year’s all-encompassing Lollapalooza lineup. The summer’s premier music festival will feature more than 170 bands on eight stages for an unforgettable four full days of music, August 1st-4th at Grant Park in Chicago. Four Day General Admission Tickets,  Four Day GA+ Tickets, Four Day VIP Tickets, Four Day Platinum Tickets and Official Hotel Packages are available now via at lollapalooza.com. Single Day Tickets will be available at a later date. Lollapalooza welcomes music fans of all ages, including kids. Children ten years old and younger will be admitted free of charge with a ticket-holding adult. Lollapalooza, recipient of the 2017 Illinois Sustainability Award, remains committed to the environment, minimizing environmental impact and raising environmental awareness. In 2018, over 1.1 million reusable bottles were filled with free freshly filtered water provided by the CamelBack Filling Stations, offsetting the number of disposable plastic water bottles and cutting down on waste. Over 145 tons of recycled and or compostable material was diverted from landfills thanks to efforts of fans, staff and ambassadors. Additionally, Lollapalooza offset 2.4 million pounds of carbon dioxide emissions; the work of 200,000 young trees over a year.